5" w/ SRS Surround Headrest Monitor. Small enough to fit any car and features Perfect View Swivel Monitor. 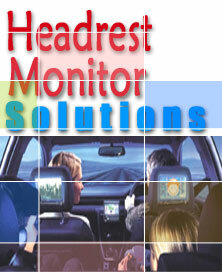 5.6" HD TFT LCD Headrest monitor with 2 Video Inputs , 1 Video Output, Crisp Clear Picture with wide view angle. 5.8" Widescreen LCD Headrest monitor with Swivel Screen, SRS Surround & built in IR Transmitter for headphones!. 6.0" TFT Widescreen LCD Headrest monitor with shroud Super Slim design will fit almost any headrest. 7.0" High Resolution TFT LCD Headrest Monitor with dual video inputs, slim design and the perfect viewing angle & universal mounting. NEW! 7.0" HD TFT LCD Wide headrest Monitor with SAVV's X-Link technology, Built in IR for wireless headphones! Remote & Awesome Picture! 7.0" Widescreen TFT LCD Headrest monitor with remote control and Swivel Screen, built in IR emitter for wireless headphones!.